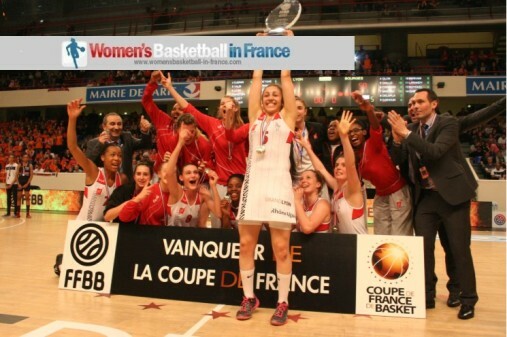 The Coupe de France basketball for women has gone through a number of changes since its creation in 1957. The first three additions of the competition had been nationwide. When it reappeared in 1981, it was not a national competition any more and its participation was restricted. We had to wait until 1995 for the competition to become national and open to all teams again. However with the gap growing between elite and amateurs teams, the competition became less interesting for the Amateurs. 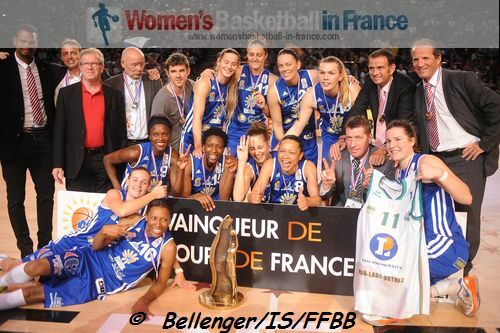 This led to the creation of a Coupe de France basketball competition for all the teams below NF1 for women called the Trophée Coupe de France during the 2004-2005 season. 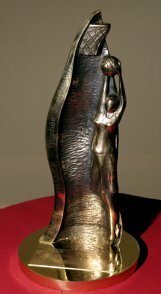 Since 2005, the teams in the LFB and NF1 compete for the Joë Jaunay trophy. Since 2000 the final of all the French cup competitions for men and women have been played at Paris Bercy. 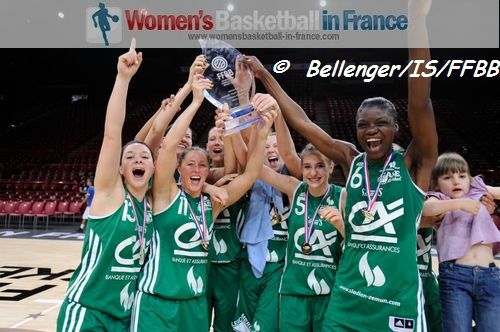 A national competition for the Under 18 age group, referred to as the "Coupe de l’Avenir", is the youth equivalent for the Coupe de France basketball competition for men and women. Lattes Montpellier: Manon Pellet 0, Virginie Bremont 1 (7 assists), Cyreille Hugues 2, Lea Blatrie 0, Mathilde Roche 2, Ana Lelas 8, Gaëlle Skrela 13, Sandra Dijon-Gérardin 12, Ines Ajanovic 13, Fatimatou Sacko 12. Mondeville: Touty Gandega 2, Anne-Sophie Pagnier 0, Esther Niamke-Moisan 3, Aija Brumermane 2, K. B. 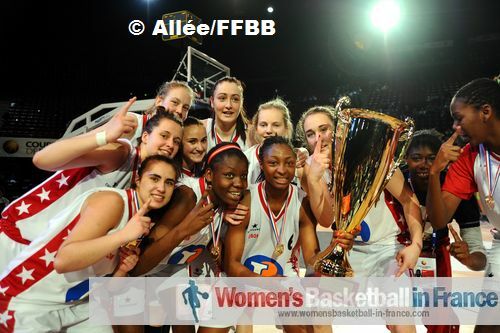 Sharp 8 (4 assists), Lenae Williams 19, Yacine Séné 4 (4 assists), Pauline Thizy DNP, Aurélie Bonnan 6 (11 rebounds), Valeriya Berezhynska 10. 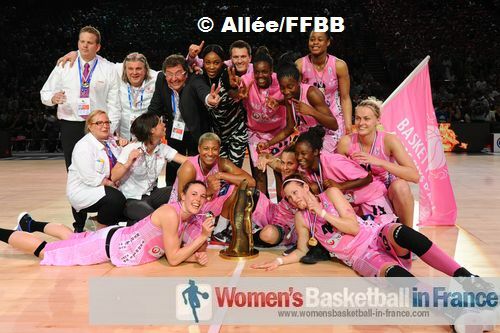 Bourges Basket: Anaël Lardy 7, Katarina Manic 6, Aurélie Fauvre DNP, Nwal-Endéné Miyem 12, Margaux Galliou DNP, Styliani Kaltsidou 18, Jennifer Digbeu 4, Ana Lelas DNP, Paoline Salagnac 2, Kelly Elanga DNP, Emméline Ndongue 14, Ilona Burgrova 2. Tarbes: Anne Breitreiner 0, Frida Eldebrink 13, Pauline Jannault 19, Elina Conduche DNP, Isis Arrondo 2, Naura El Gargati 0, Florence Lepron 4, Béatrice Castets DNP, Fatimatou Sacko 22, Emma Randall 2. Bourges Basket: Dumerc (13), Santos (11), Manic (9), Ndongue (9), Lelas (9), Miyem (8), Bujdoso (5), Melain (3), Martins (1), Cata-Chitiga (-), Paul (-), Barroilhet (DNP). Tarbes: Wright (27), Jansone (13), Eldebrink (9), Yacoubou-Dehoui (7), Arrondo (4), Tzekova (3), Rusakova (-), Castets (-), Arfelis (-). Bourges Basket: Melain (11), Snell (9), Ndongue (9), Petrovic (9), Dumerc (8), Miyem (6), Kireta (5), Cata Chitiga (4), Bujdoso (2), Lepron (-). Villeneuve d'Ascq: Sacko (16), Robert (10), Fombonne (6), Drljaca (6), Crawford (5), Wambe (4), Dantas (4), Albicy (-), Alves (-). USVO: Gruda (14), Bade (11), Harrower (11), Grgin Fonseca (8), Godin (6), Tuvic (4), Michel (2), Digbeu (1), Hermouet (-). Bourges Basket: Maltsi (13), Kireta (10), Lepron (8), Paul (7), Melain (6), Miyem (6), Ndongue (2), Salvi (DNP), Hall (DNP), Dumerc (DNP). Bourges Basket: Godin 5, Palau 8, Melain 3 (4 steals), Dumerc 9 (6 assists, 6 fouls provoked), Jekabsone 5, Ngoyisa 28 (12 rebounds), Krawczyk 3, Reghaïssia 0, Pavetic 0. USVO: Grgin-Fonseca 4, Le Dréan 11 (9 rebounds), Harrower 11 (7 assists), Gruda 12, Hermouet 5, Gruszczynski 0, Digbeu DNP, Kireta 7 (7 rebounds), Tuvic 6 (8 rebounds), Badiane (DNP). Bourges Basket: Godin (18), Bjedov (12), Dumerc (9), Palau (9), Drljaca (8), Reghaïssia (8), Jekabsone (7), Bertal (3), Krawczyk (-). Valenciennes: Le Dréan (16), Sanchez (14), Feaster (7), Berthieu (7), Tuvic (4), Gruszczynski (1), Sauret (-), Penicheiro (-), Gomis (-), Merlot (-). Valenciennes: Lawson (18, 11 assists, 7 rebounds), Feaster (12), Le Dréan (9), Wauters (15, 7 rebounds), Batkovic (5), Brown (11), Bertal (0), Dieng (0), Gomis (4), Duquesne (0). Mondeville: Koechlin (7, 6 assists), Jekabsone (17), Doan-Reimer (11), Bonnan (16), Azace (4, 7 rebounds) Mendy (2), Legoupil (3), Cayot (0), Modicom (0), Jolivet (0). Valenciennes: Tomaszewski (2), Le Dréan (12), Feaster (7), Lawson (9), Batkovic (9), Sauret (13), Antibe (22), Wauters (26), Bertal (0), Joly (0). Villeneuve d’Ascq: Zodros (0), Malonga (0), Fombonne (4), Volnaya (15), De Mondt (3), Pochet (0), Wambe (13), Reghaissia (9), N’Goyisa (16), Sauer (8). Valenciennes: Tomaszewski (0), le Dréan (3), Feaster (12), Lawson (5), Sauret (14), Lesdema (8), Edwards (4), Wauters (16), Fijalkowski (6), Beres (5). Bourges: Janostinova (2), Sene (0), Poto (12), Souvré (4), Drljaca (9), Korstine (13), Antibe (9), Melain (16), Dijon (5), Ndongue (0). Valenciennes: Sil’yanova (4), Le Dréan (2), Alvaro (14), Tomaszewski (6), Sauret (5), Martin (7), Ayissi (6), Wauters (23), Fijalkowski (4), Mirkovic (13). 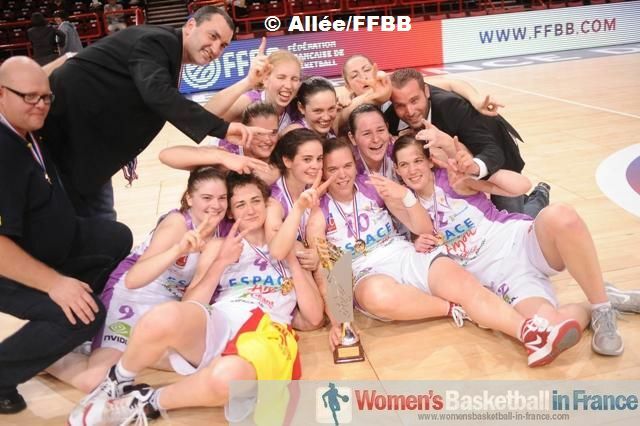 Aix-en-Provence: Falcoz (5), Mercier (2), Lawson (15), Bouygues (2), Agbatan (14), Gisselbrecht (12), Viotty (2), Jekabsone (11). Aix-en-Provence: Falcoz (3), Le Dréan (16), Seigle (0), Lawson (8), Koechlin (0), Gisselbrecht (4), Lesdema (4), Feaster (14), Dove (2). Valenciennes: Savasta (9), Alvaro (3), Vanbleu (0), Agbatan (2), Martin (3), Palie (0), Wauters (18), Pchikova (10), Gomis (0), Mirkovic (3). Mondeville: D. Tregoat (14), Delauné (8), Tournebize (9), Nikipolskaïa (25), Gueorguieva (14), Lacroix (20), Francillette (2), Waltz (2). Toulouse: Dord (18), Agbatan (18), Beglarian (23), Hemery (2), Mulders (0), Martin (6), Fortun (3), Koson (4).